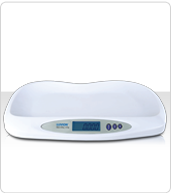 These beautiful digital Luvion baby scales has an LCD screen which clearly displays the weight of your baby. The scales are also ideal for watching how much breast milk the baby has drunk. Compare the weight of the baby before and after feeding and you know immediately how much the baby has eaten. The ergonomic curve of the scales slowly descends towards the centre. This ensures a stable and safe lying position your baby. The Luvion baby scales are accurate up to 5 grams and can be used with a maximum weight of 20kg. The tara function of the scales, enable you to calibrate the scales. All in all the baby scales are very user friendly.